Discover Burma (Myanmar), an exotic land of tradition and sacred sites from the awe-inspiring religious monuments of Yangon to evocative Mandalay and its Royal Palace, the spectacular stupa-filled plains of Bagan and heavenly Inle Lake with a few surprises along the way. If you are seeking colonial architecture, countless temples, stunning landscapes and locals welcoming you with open arms, this is the trip for you. Upon arrival at airport, welcome by our Guide and he will be held on placard with your name on it. And then transfer to hotel for check-in. 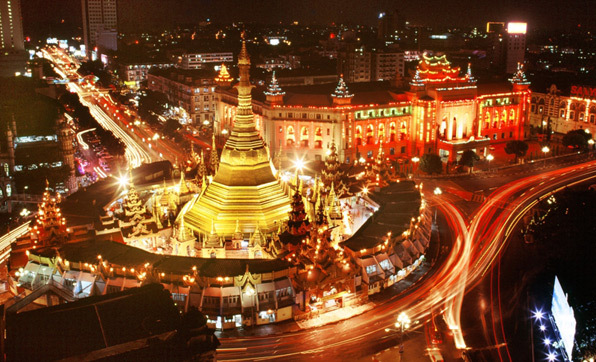 Yangon, formerly known as Rangoon, is still a relatively quiet and charming city. Its impressive colonial and spiritual heritage makes Yangon one of the most fascinating and authentic capitals of South-East Asia. 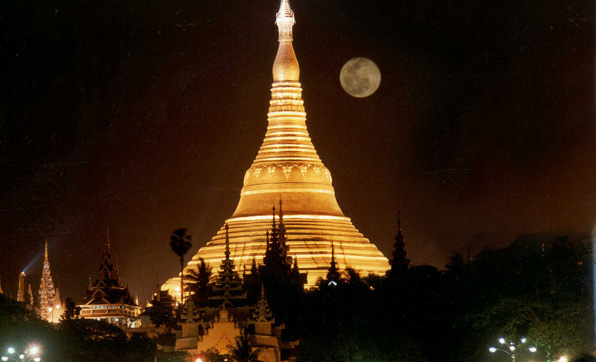 On the way visit Shwe Taw Myat Zedi (Buddha’s Replica Tooth Relic Pagoda, Kaba Aye Pagoda (World Peace Pagoda) built for memorial of the 1954-56 sixth Buddhist Synod, is located on Kaba Aye Pagoda Road, Mayangon Township. And then proceed to Mahapasana Guha: “Great Cave“, built close to the Kaba Aye Pagoda. After check in the hotel, take some relax for a while. Afternoon sightseeing Chaukhtatkyi Reclining Buddha Image: 230 ft (70 m) long in the pose of rest, the original image was built in 1907 and Shwedagon Pagoda: world famous glistening gold stupa towering over the city with spearing to height of 326 fees. One the way you can see, street vendors, hawker, ways of life of Myanmar people, green forest & farms, other sightseeing. Early morning arrive at Mandalay Station. And then proceed to excursion to Amarapura, an ancient capital of Myanmar, where we can observe the life of over 1000 monks at Mahagandayon. Visit Bagaya Kyaung and famous U Bein’s teak bridge. After that, drive to Sagaing, cross the Inwa Bridge, you see the hilltops, each crested with a pagoda, the banners proclaiming the Buddha's teaching, the refuge from all ills and tribulations where over 600 monasteries for monks and nuns are located for Buddhist studies and meditation. Ann then visit to Ava; an ancient city of Burma King in 1783. If you have time permit, you can enjoy the sunset at Mandalay Hill. Overnight stay at Hotel in Mandalay. After breakfast at the hotel, transfer to Shwe Kyatyat jetty and sail to Mingun by boat. 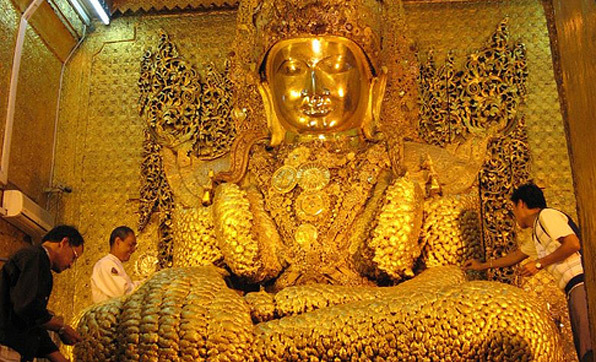 The Bell, which the world 3rd largest, was made of bronze; but it is said that Buddhist devotees inserted gold, silver ornaments and jewellery into the bronze. The Bell measures eleven cubits and four thits (fingers) in diameter at its mouth; 33 cubits, one mit (6 inches) and four thits in circumference and 13 cubits, one mit and four thits in height. It weighs 55555 viss. After that we visit to village and observe their living life. Then drive back to Mandalay. Come back to hotel and leisure. 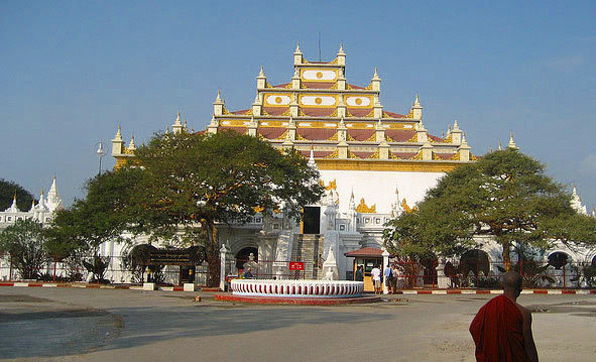 After transfer to Sagaing to visit Ywahtaung village, Kaungmudaw Pagoda- an enormous solid dome-shaped Pagoda and picturesque Sagaing Hills, a retreat for Buddhist devotees with numerous pagodas and monasteries, and then visit to other interesting sightseeing if you have time permit. In early morning, after breakfast, transfer to Mandalay Gowain Jetty. Sail to Bagan. Leisure time on the boat, take the relaxing and sightseeing of panoramic view the great Irrawaddy River. In the afternoon, arrive at Bagan jetty. Transfer to Hotel. Overnight stay at hotel in Bagan. Breakfast at hotel. Transfer to Yangon Airport for domestic flight to Bagan. 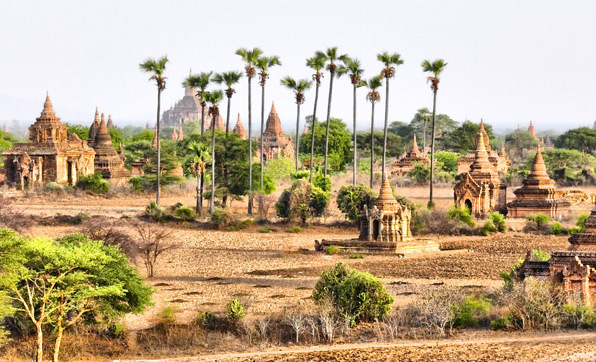 Upon arrival in Bagan, transfer to hotel and proceed on a sightseeing tour, starting with the busy local market and continuing with visits to a diverse selection of the most important pagodas and temples such as Shwezi Gon Pagoda, built by King Anawrahta in the early 11th century. See 13th Century frescoes adorning the corridors of Kyansittha 'Cave' Temple. Continue to Gubyaukgyi (Wetkyi In village), another 'cave' temple with fine frescoes of the 'Jataka Tales'. Next stop is Htilominlo, the last Bamar style temple built in Bagan, with old murals and friezes. Visit the Taungphi village to see old monasteries, which have beautiful Khone Baung dynasty frescoes. In the afternoon, visit continue to Ananda Temple, a whitewashed masterpiece of Mon architecture with four standing Buddhas, and the adjacent brick monastery from the early Bagan era with well-preserved murals. Make a photo stop at the tallest temple measuring 61 meters - Thatbyinnyu known as 'temple of omniscience' and dating from 1144. Continue to Mingalazedi, the last of the large Pagodas built in the 13th Century, representing the pinnacle of Bamar pagoda architecture. Enjoy sunset at one of the monuments along Ayeyarwady River. Breakfast at hotel. This morning we have time to explore the Myinkaba village area either by bicycle or by horse cart. First we visit Gubyaukgyi Temple admiring the fine stuccowork. We continue to Nanpaya temple, built in the Mon style with intricate stone carvings, and said once to have been Manuha's residence. 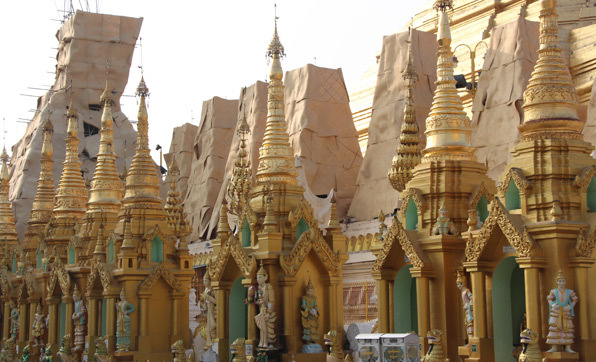 See the four Buddha images in Manuha Pagoda and later stop at Myazedi stupa to see Myanmar's "Rosetta Stone", bearing inscriptions written in four languages. In the afternoon, visit to Lacquer ware shop to watch craftsmen skill fully making this most famous of Bagan handicrafts. After that visit to Abeyadana Temple with frescoes representing Bodhisattvas and the gods of Indian mythology, continue to Dhammayangyi, a massive-looking temple dating from 1170 that is famous for its interlocking mortar less brickwork. Next, visit Sulamani, one of Bagan’s great two-storied Bamar style temples, which has 4-seated Buddha images. 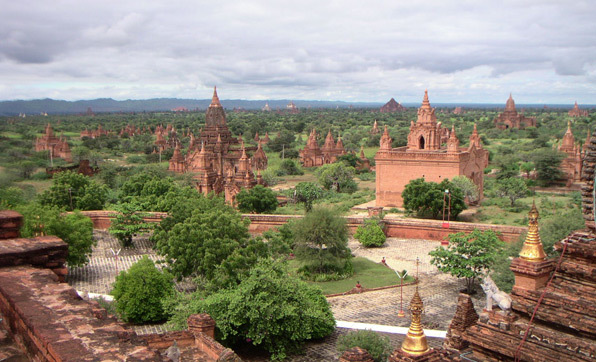 Observe a sunset in the vicinity of Bagan’s ancient monuments. 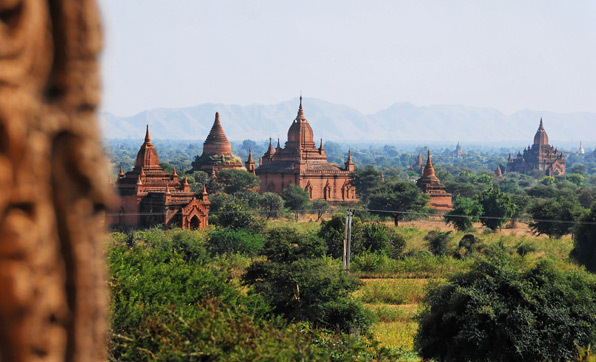 After breakfast, it is just a short, easy ride across the desert plain form Bagan to Mt. Popa, rises 1520 meters into the sky. Climbing to the summit take about 45 minutes and you can observe the birds at Popa. And then Mahagiri Shrine dedicated to the “Nats” (spirits) at the top where there is a wonderful panoramic view. In the evening, you may wish to trek through the jungles path and hike up to the summit. And then back to Bagan, en route stop at Toddy Fileds to observe how to make Jaggery. Breakfast at hotel, transfer to Mandalay Airport flying to Heho. Then drive about 2 hours to the small quite town, Pindaya and to enjoy the great scenic beauty of the countryside along the road to Pindaya. Visit Pindaya Caves: these caves are ensconced in a limestone ridge overlooking the lake. Inside the cavern there are more than 8000 Buddha Images-made from alabaster, teak, marble, brick, lacquer and cement and are arrange in such a way as to from a labyrinth throughout the various cave chambers. Then proceed to Shwe U Min Paya: this is a cluster of low supas just below the ridge near the Pindaya Caves. And then pay a visit to Traditional Shan Paper Making Workshop and Umbrella Making workshop and then proceed to Kalaw. Overnight at Hotel in Kalaw. Breakfast at hotel. This morning scenic drive (64 km – 2 hours) across the Shan Plateau to Nyaungshwe where we board our own boat to go to our hotel in Inle Lake. In the afternoon, we enjoy another boat tour to Indein, at the western end of the Lake. The boat takes you through a long channel where you watch the farmers cultivate their produce. This ride is one of the most scenic boat tours on Lake Inle. The beauty of sunset over Inle Lake enchants all visitors. Overnight at Hotel in Inle. Breakfast at hotel. This morning, explore one of the 5-day markets (on market day only). By visiting 5-day markets, clients will get insight into the life-style of the ethnic Pa-O, Danu and Intha inhabitants who came to these markets to sell their goods. 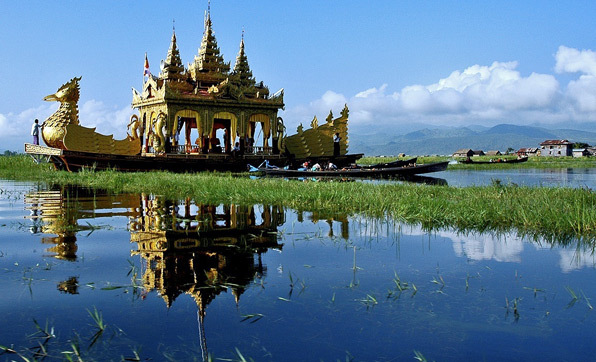 Enjoy boat trip on Inle Lake – a photographer's dream, its calm waters are dotted with floating vegetation and fishing canoes, to which scenic high hills provide the perfect backdrop. See the lake's unique “leg rowers” – the Intha people row standing up with one leg wrapped around an oar. 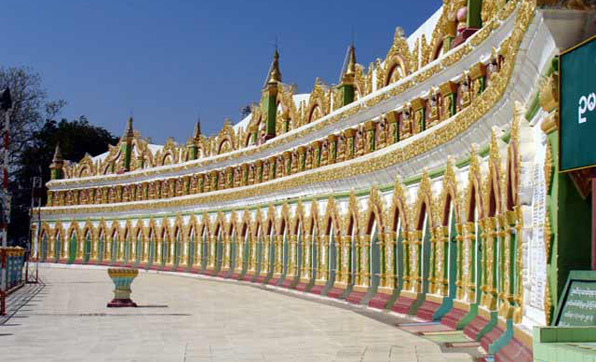 Visit Phaung Daw Oo Pagoda, the holiest religious site in southern Shan State. See traditional handicrafts - silk weaving on wooden handlooms and a blacksmith shop. 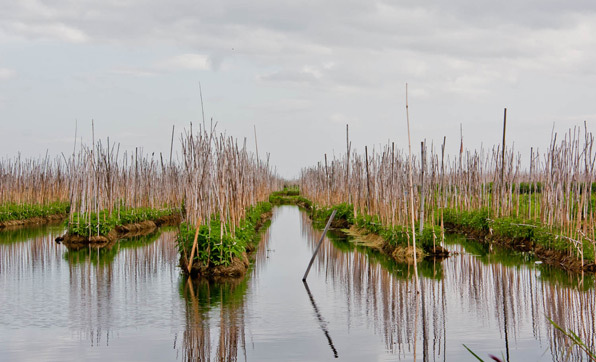 Pass endless floating gardens, where fruit and vegetables are grown. Continue by boat to visit Nga Phe Kyaung Monastery, one of the oldest monasteries on the lake. One can see ancient Buddha statues which are more than 200 years old. Breakfast at the hotel, afternoon transfer to Nyaung Shwe Junction to take bus for heading to Yangon. Morning arrive at Bus station, and then transfer to hotel. The whole day is free & leisure. Breakfast at the hotel, Then transfer to Airport for departure flight. 2 night accommodation on the Train & Bus and breakfast at local restaurant. Domestic airfare ticket with airport tax from Nyaung Oo to Heho. Train ticket fee from Yangon to Mandalay. Bus Ticket fee from Nyaung Shwe to Yangon. 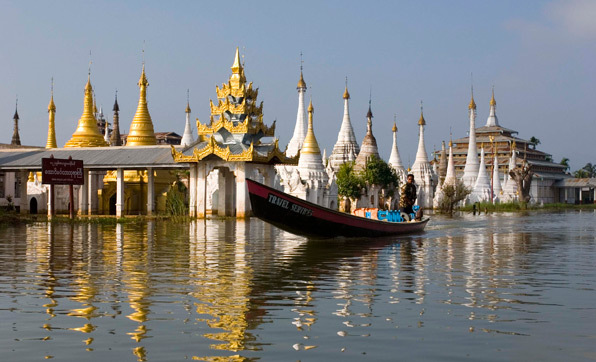 Private boat fee from Mandalay to Bagan. Sightseeing on Inle Lake by private boat. 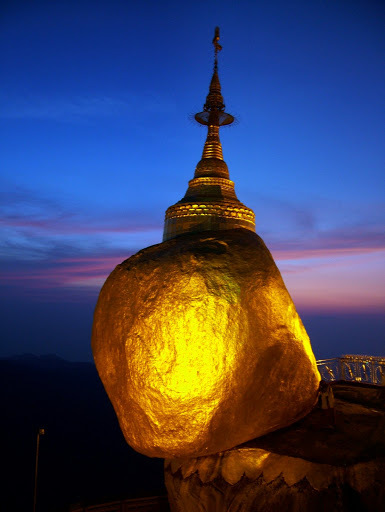 Trek car fees for Mandalay Hill & Sagaing Hill. Boat fee for Mingun Trip. Horse car and boat fee in AVA. Visa fee for Myanmar-Visa on arrival’s 38/- p/pax. Visa stamp at related embassy: USD 20/- p/pax. International air tickets to/from Yangon. International airport departure tax at USD 10.00 per person. Camera or Video Camera fees. Tips and gratitude to guides / drivers / porters at the hotels. Other services are not mentioned above including.